While filmed around downtown Victoria BC, US & THEM, produced by Krista Loughton and Jennifer Abbott (The Corporation) could take place in any Canadian town. Through her compassionate style of documentary filmmaking, Krista Loughton lends a familiarity to all that she interviews. Krista's subjects aren't "just homeless." They are not faceless apparitions wandering the streets. These people are the friends and family that we all know in our communities, who need our support. 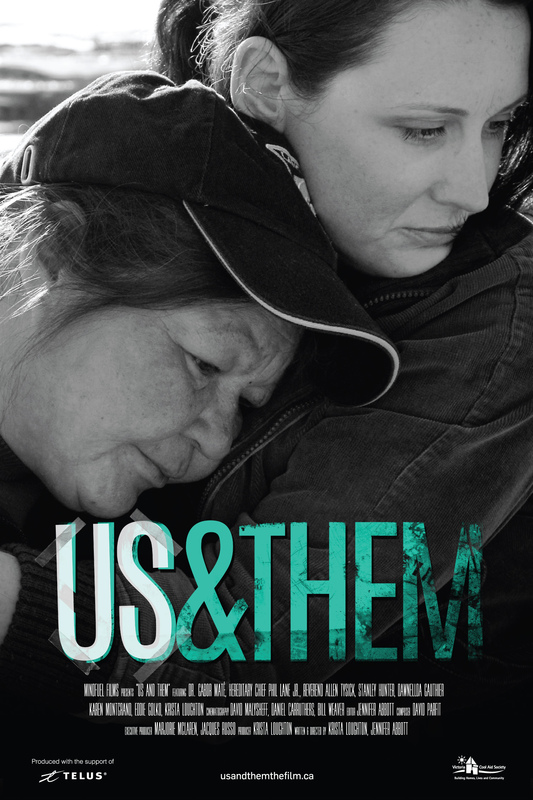 US & THEM shatters misconceptions about why people end up on the streets, and reveals why the "pull yourself up by the bootstraps" narrative is heavily flawed. As one such interviewee, Dawnella Gautherier, reveals, leaving the streets is not as simple as going to the neighbourhood shelter. In the late 2000s, Dawnlella found herself banned from multiple shelters because of violent night terrors that she was afflicted with, caused by the death of her son. The goal of US & THEM is to educate as many people as possible on the realities of homelessness, and to encourage proactive solutions. Filmmaker Krista Loughton wants “people to watch the film and never look at a street person, or themselves, in the same way again.” To organize a screening in your town, go to usandthemthefilm.ca or email krista@usandthemthefilm.ca. Krista Loughton has been passionately working on her first feature length documentary, US & THEM, for the past decade. Encouraged by her success of two previous films on homelessness, Loughton created the concept for US & THEM, a feature documentary that chronicles her experience befriending four chronically homeless, who ultimately change the course of her life. She participates on-screen in the film, while producing and being one of its writers and directors. Loughton is the programming and community liaison at CineVic Society of Independent Filmmakers, and is a central figure in her local independent film scene in her city. She has offered advice to countless filmmakers and develops curriculum for all the courses offered through CineVic. Loughton has also worked extensively as a producer, director, editor and videographer on many short independent narratives, documentaries and music videos. She owns and operates MindFuel Films Inc., in Victoria, British Columbia.